In 1955 Margaret Sweeney from Auckland became the first person to swim across Lake Taupo. This still stands as a huge achievement as only a relatively small number of other swimmers over the next 64 years have completed the swim. There are now (as at 29 March 2019) 56 swimmers who have completed the big Lake Taupo swim. 62 successful swims in all. 8 of these swims were with wetsuits, so they have been split out into their own section (as in the marathon swimming world wearing a wetsuit voids the swim from a records perspective). 4 people have swum the lake on more than one occasion (John Coutts, Sandra Blewett, Phil Rush and Ben Campbell-Macdonald). Only two people have been crazy enough to complete a double crossing (Sandra Blewett and Phil Rush). The fastest crossing was in 1985 by the legendary Kiwi distance swimmer Phil Rush (10hrs 14minutes). He also holds the record for the fastest double crossing (23hrs 05minutes). The youngest person to complete the challenge is Kaine Thompson – he had just turned 14 when he took on the big lake. The oldest person to complete the challenge is Gabrielle Gunn at 61 years young. Note: Blain Cox made his crossing on the 30th anniversary of his father Patrick’s swim. As this is the first time a full list has been compiled there may be errors or omissions. Thanks to those that have contributed to it, and for everyone else out there, if you have more information about these swimmers and their Taupo swim experiences – please leave a comment on one of my posts and I’ll be able to get back to you. This site has a great picture of Margaret Sweeney at the end of her marathon swim across the lake, showing just how tough this challenge is. 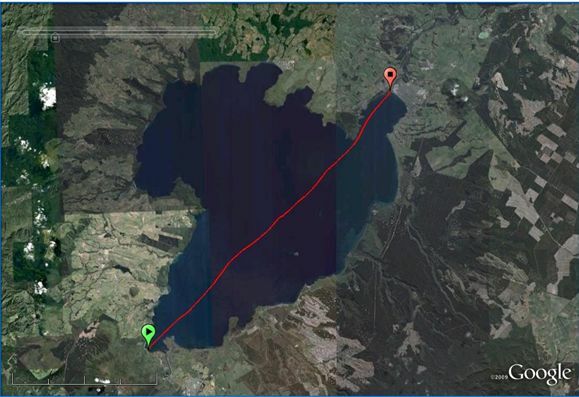 Was there a marathon swimming race over Lake Taupo? Dawn to Dusk? Yes indeed the ‘Dawn to Dusk’ event did exist across Lake Taupo. This was before my time on the lake – but my coach Ali Dennis knows a lot more about it than I do. There are still a few boat skippers on the lake that remember it too. I’m not sure when the last event was held, but it can’t have been long into the 2000’s. The main focus of the Dawn to Dusk event was relays – and I think there were some speedy teams over the years. I doubt it will ever be back – the logistics would be pretty full on, and it would take an organiser with a great deal of passion for it to fly. Only option at the moment is to go it alone. Hello in 1984 Michael Quinlivan of Christchurch conquered the lake end to end also. It was in February, he had also conquered Fouveax and Cook Strait as well as Wakatipu. I swam that Dawn to Dusk as part of one of Ali Dennis’ teams in 2000 (I think). Took our team of 6 about 14+ hours. The winners were a lot quicker. Great job organizing these records! What a valuable resource. Question: for swims where the ‘Comment’ column doesn’t indicate short course or long course, does that mean the swimmer’s specific route is unknown (aside from N-S or S-N) ? Was the 2nd NZ marathon swim series also short course (like the 1st), or is that also unknown? Thanks for any info. Thanks for your kind words – and to answer your question, if that comment column is blank then we don’t know for sure whether they did the short course (starting at Stump Bay) or the long course (starting from the DOC beach near Little Waihi). I am not sure about the 2nd NZ marathon swim series, but I could ask Phil Rush whether he can remember. There are a few people lined up to give the long course, or 40.2 challenge a go this season, so I’ll be hoping to keep the records going. Thanks, Anna. We have a similar situation in California, with Lake Tahoe (the lengthwise swim is the same distance as the Lake Taupo “short course”, albeit at 1900m elevation). The first known crossing was in 1955, with 40-or-so successful swims since then. Unfortunately, until recently the record-keeping has been spotty, with several different routes and lots of hazy memories. So I understand the challenge!